PSV Proportionating Electromagnetic Valves are designed to respond to variable power inputs to regulate the flow of liquids and gases proportionately. For added safety PSV valves are normally closed (NC) when deenergized. 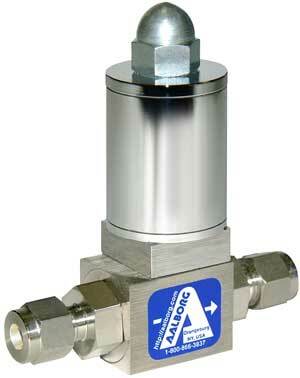 They can also serve as “ON-OFF” valves. For control functions see the optional PSV-D Driver Module. Flow is controlled by increasing or decreasing the voltage applied to the coil. This causes a magnetic force which raises the core and allows gas to flow. PSV valves, constructed of stainless steel are available in five different sizes covering flow ranges from 3.5 sL/min to 100 sL/min air and 125 mL/min to 2.85 L/min water. A variable stroke electromagnetic valve featuring a valve seat design which permits increasing or decreasing flow rates of liquids or gases through it in proportion to variable input power.